Population totals barely budged in New York State between 2016 and 2017, according to the latest annual U.S. Census Bureau estimates. During the 12-month period ending last July 1, the 50 counties of upstate New York lost another 3,596 residents, a drop of just 0.05 percent. At the same time, the downstate region (New York City, Long Island and the lower Hudson Valley) gained a combined total of 16,708 people, an increase of about 0.1 percent. The net result was a statistically insignificant rise of 13,113 in New York’s estimated statewide population in 2016-17. 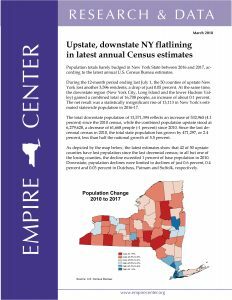 The total downstate population of 13,571,394 reflects an increase of 532,965 (4.1 percent) since the 2010 census, while the combined population upstate stood at 6,279,628, a decrease of 61,668 people (-1 percent) since 2010. Since the last decennial census in 2010, the total state population has grown by 471,297, or 2.4 percent, less than half the national growth of 5.5 percent. As depicted by the map below, the latest estimates show that 42 of 50 upstate counties have lost population since the last decennial census; in all but one of the losing counties, the decline exceeded 1 percent of base population in 2010. Downstate, population declines were limited to declines of just 0.6 percent, 0.4 percent and 0.03 percent in Dutchess, Putnam and Suffolk, respectively. Suffolk County is continuing to lose population, but at a much slower rate than indicated in previous annual census estimates, which have been updated in the latest release. Since 2010, Ontario and Saratoga remain the only New York counties to have experienced positive domestic migration, meaning they attracted more new residents from the rest of the nation, including other New York counties, than they lost (see map below). Brooklyn, Queens and the Bronx, in that order, have experienced the state’s largest overall population increases since 2010, driven mainly by large natural increases. Elsewhere downstate, the largest percentage increases in estimated population have occurred in Rockland and Orange counties. Upstate, only Tompkins and Saratoga counties have experienced population growth faster than the statewide total. In percentage terms, the biggest population losses since the last decennial census have been in upstate rural areas: Hamilton, Delaware, Chenango, Tioga and Orleans counties. New York (borough of Manhattan) and Queens have been the only New York City counties with gains from net migration (domestic plus foreign) since 2010. Outside the city, net migration increases were estimated for seven counties: Albany, Erie, Nassau, Ontario, Saratoga, Tompkins and Westchester.